The vintage style rocking bridge has been used for many years by Fender on the Jaguar, Jazzmaster, Mustang, Jagstang and Bass VI. One of the original design concepts of this type of bridge is often misunderstood, namely the rocking action whereby the bridge will rock back and forth when the tremolo is operated. The support posts at either end of the bridge have a pointed screw going through on which the bridge sits when it is installed. In the guitar body are two metal cups, or thimbles as they are better known, with a hole drilled that does not go right through. These can be seen in the photo of a Fender bridge and thimble below. The screws are also used to adjust the height of the bridge and achieve the desired action, this is the distance between the strings and the fretboard. The diameter of the bridge support post is smaller than the size of the hole in the thimble by 1mm on most models and 0.5mm on some made in Mexico models. 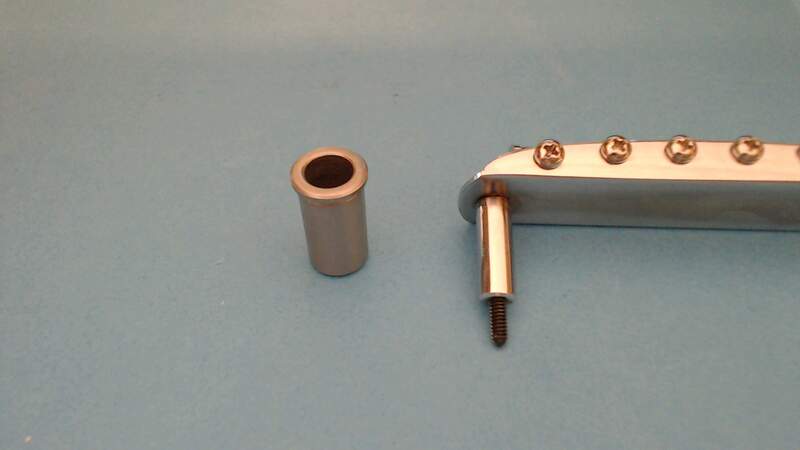 The reason for this is so that the bridge will be allowed to move or rock back and forth with the movement of the tremolo by pivoting on the pointed end of the screws. If the bridge were fixed, and not able to move, the strings would have to slide across the saddles when the tremolo is used and due to friction they may not always return to the exact same position thus causing the guitar to go out of tune. The rocking design feature is not perfect, as with many things in the guitar world, but if set up correctly it should work without any problem. When setting up this type of bridge it should be initially set to an approximate midway position so that is free to move equally in either direction. Over time during playing it may creep away from this mid position, depending on how much the tremolo is used, but it is very easy just to move it back to where it should be. Staytrem bridges have improved support posts but are still designed to function the way Fender intended. Our replacement for the Adjusto-matic bridge has a different type of mounting but it is still designed to function in exactly the same way. Some players do not use the tremolo and prefer the bridge to be fixed so there is an option available on Staytrem bridges for the movement to be restricted.